New To Emule Need guides. I'm new to Emule. I need guides to setup Emule on my pc. I'm using a 54mpbs Wireless TP-Link ADSL2+ Modem router. My PC is using Windows 8.1 (64bit). How do I forward the required ports to my local IP? First of all go to Wiki look at the official TCP/UDP ports for incoming and outgoing transmissions. You don't have to use same ports go in preference and change it to your liking. Just log into your routers setting and enable those ports. Most home routers by default allow outgoing traffic but drops incoming, but makes no difference as you should define those policies. So what that means for you is you need to specify the port and bind it to fixed LAN which will be allocated to the PC your using. 1) Software firewall: Windows firewall in your case make sure xMule has full passthough. 2) Hardware firewall: Model/Router make sure ports are open for in/out while it's directed to correct LAN address. 1. Do I have to wait that long for the videos to complete? 2. Can I shut down my PC while the files are downloading? That looks like standard full cone static NAT table correctly setup. Look in your advance setting and make sure if any internal firewall setting is in effect, which can STILL effect service even if they are defined. If your router supports DPI/SPI make sure you turn it off. Currently most home based units offer some type of packet inspection, which I believe is what causing this on your end so make sure it's off. 1) Yes, depending on the availability of the current source which is unable to connect to you. But the ideology of ED2K is also in play which is first come first serve as you have very large queue system which insures balance availability for chunk redistribution. 2) LOL, now your just being funny lol trying to pull a fast one lol. How are you going to download if the PC that is your P2P client is hosted on is shut off? Where is those data will be saved? If the storage device is off. But yes I do have one running home and one remotely which allows me to do this. Does that mean my PC and router have to be switched on even the download takes like 5 days to complete? If I read well you still have a low ID and the problem should be the wrong IP address in all the rules: you have to use the computer IP, not the router IP. if so, your IP is 192.168.1.100, but please remember this is just an example. About your firewall: check your network is a Private Network in Windows, then close eMule, remove all entries about eMule and start eMule again, then your Windows firewall have to ask you to enable eMule and you can enable it. About eMule ports: there is no reason in the world to use 4662 and 4672, just do not think these ports are "magic" or "the right ports to use". Yes, come on lets be logical lol unless you run something like this remotely. Yes there is possibility he/she put wrong IP but normally the default gateway is omitted from available valid pool range thus this does not happen. Hopefully Sirniz didn't enter wrong LAN-IP, this is why STATIC NAT is very important or we have to deal with dynamic cone and port trigger passthough and other symmetric NAT and its inherent problems. 1. What's the right port numbers? mind to share? 2. Where should I change the IP address? There is no right or wrong port number. It just has to be configured correctly, which you do looking from the screenshots you posted as its full cone PAT. What Zangune was saying is make sure those ports that are currently open though your router are sending trafficthe correct LAN-IP address which is assigned to the PC. Here ill help you get machine IP. Go to https://ipleak.net/ which test for WebRTC and DNS leak to get current /bin/iproute. Take a screenshot of that and post it here and ill tell you howto set it up. If you are using a more modern OS than windows xp, the second choice, everyone has the same configuration and downloads, should be the less problematic. Searching the forum, you will find dozens of topics on this! Check if your ISP is giving you a real public IP address (i.e., not "NATted"). You can examine/check/read your ISP website: it eventually could have a FAQ section regarding that problem. A simple method to check if you have got a real public IP address: find your public IP address, then paste it in your browser address bar, and see if it asks you user name and password (of your router). If that will NOT open the log-in window, your ISP probably is giving you a NATted IP (i.e., you are behind their proxy/router or whatever), but keep in mind this method couldn't always work. Other methods to know if you have got a real public IP address are to google your "ISP and emule" or to ask informations about your ISP in specialized forums/chats: someone using your same ISP could know if emule works without problems or if you must call your ISP to enable the real public IP address. EMule has got an IRC section you could use it: connect, go to your emule-language (probably emule-english is better than emule-usa) channel and ask it. If it isn't clear enough if you have got a real public IP, you can call your ISP. If it doesn't give you a real public IP address, ask it if it can change this situation. It could do it for free, or under payment, or it couldn't do it at all. If you are using some special programs to block IPs (ipfilters/peerguardian/peerblock) or to "hide" your IP (VPN/proxy), try first without them. If you installed different internet security suites or firewalls, make sure you have uninstalled them completely and in the correct manner. Use only ONE firewall on your pc (in addition to the firewall router). Check if you have got two routers. Sometimes people think to have a simple modem provided by their ISP, whilst in fact they have a router (in addition to their own router). If this is the case, you MUST do two port forwarding rules, one for each router. Or you can set the first router as "transparent", i.e. it will become like a simple modem (you can set what it's usually called as the "bridge mode"). Check if your router has got the "reserve ip address"/"static dhcp" function. You can usually find it in interface setup - lan. If it is present, you either can use it or can set a static IP to your pc; it is more convenient/advised/suggested to use that function instead of setting a static IP to your pc. If you use that function, you shouldn't usually set a static IP to your pc. Some routers have got an automatic configuration button for this purpose: if it is present a button "get it", "set it", "find it", or whatever, click it and save the settings. Set ip address to 192.168.1.2 (or an IP address that is not already used by other devices). How to find the correct MAC address? Right click start, command prompt, (inside the command prompt) type getmac, press enter on your keyboard, you should see your MAC address under Physical Address. Set host name (if present) to your host name. How to find the correct host name? Right click start, command prompt, (inside the command prompt) type hostname, press enter on your keyboard, you should see your hostname right under your command. Click add/save/save settings/commit/remember/whatever button does the job to save them. If instead it isn't present, you must set a static IP to your pc. My router hasn't got that function, hence I must set a static IP (in my LAN settings, i.e. Control Panel\Network and Internet\Network and Sharing Centre, I click my connection, I click properties, I double-click internet protocol version 4 (tcp/ipv4), I set my static ip and click ok). If you'll need help to set a static IP to your pc, don't hesitate to ask! You can see if NAT is enabled in three locations: status - device info, advanced setup - NAT, interface setup - internet. You can disable/enable NAT only in interface setup - internet. advanced setup - firewall: SPI MUST be disabled, otherwise port forwarding won't work. Other routers could have a BlockAll function in their firewall, but in this one should be SPI (I know because your router is very similar to my router). Advanced setup - NAT - virtual circuit: the entry listed here MUST be the same you see in interface setup - internet. I used two consecutive ports, 4662 and 4663, but you can use any consecutive ports (between 1 and 65535) you prefer. Examples: 1 and 2, 65534 and 65535, 10 and 11, 11111 and 11112, and so forth. Open emule, go to options, connection, set the ports 4662 and 4663 (4662 tcp and 4663 udp, or 4663 tcp and 4662 udp, it doesn't matter), click ok, click ok, close emule, restart your pc and your router/connection. If you have chosen two other consecutive ports, instead of 4662 and 4663, you must set them (obviously). Search files possibly with high availability and at least 1% of complete sources. The more sources the file has got, the faster the download will be. The less sources the file has got, the slower the download will be. Zero sources = infinite download (it will never be completed). PS: we could be more precise if you write the exact model number of your router. No you did good and provided what I asked for. The IP 60.54.57.79 is your WAN which is assigned by your ISP which is what other ~Mule client will see when they they trying to download/upload to you. Now the IP 193.168.1.1 is your gateway aka the dual modem/router which is the interface you connect to for admin settings so you can modify the next step. Now go back to the same port setting as you posted on the screenshot above now modify 192.168.1.1 to 192.168.1.2 (which is your LAN-IP) inside your home network. 1) The computer your on now is 192.168.1.2 so go to attached devices get the MAC address and make this computer STATIC LAN. Which means this computer will always have this internal IP address. 2) Now change the IP from 192.168.1.1 to 192.168.1.2 in port settings you currently have a loopback and thus those packets timesout. 3) Disable IDS/STI on node 192.168.1.2 and make sure remaping of these ports are not done. Keep in mind 2 LowID clients can't connect to each other so if those source who your trying to get file from or who your trying to get file from. It is possible for LowID to connect to HighID client via help of ED2K-Svr but that comes with extra overheads which is what we dont need. UDP port 4665 is used for global server queries. What would happen if suddenly my Internet gets disconnected while the downloads are in progress? 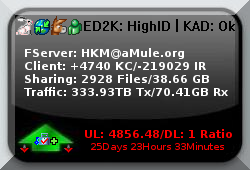 Do I have to re-connect eMule or re-download everything? If your disconnected then nothing happens. Your ~Mule client will get disconnected and your download/upload will come to halt as logically without active data transfer it can't persist. Now you can manually reconnect or you can have it done auto where it will connect if its disconnected automatically. You don't need to worry about re-downloading the whole file lol we are not in the old era of Napster or early FastTrack. ED2K was designed with that in mind as we break down file in chunks which are 9.28MB. So in an event let say you download 30MB video file its broken down in (3x9.28MB + 2.16MB) chunks so it will be total of 4 chunks. If let say you downloaded 3 chunks and 4th one is some how corrupted then it begins to redownload the corrupted chunk. Now with ICH enabled it avoid redownloading the whole chunk when possible as its broken in 180KB so there is no need to download it again as that part is corrupted will be downloaded again. Why is this video cannot be downloaded? What does the "shared" mean?